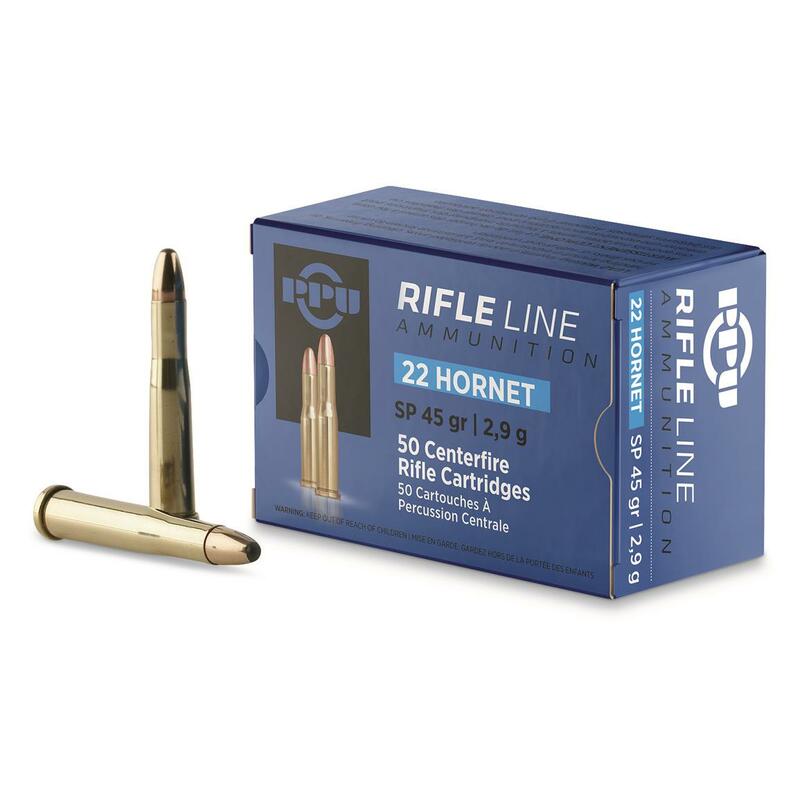 HOT ammo for hunting and plinking, made affordable. PPU .22 Hornet, SP, 45 Grain, 50 Rounds is rated 4.8 out of 5 by 30. Rated 5 out of 5 by Gordon from Great price, lots of choices and great service. Rated 4 out of 5 by Greydog from Great Value PPU makes really good ammo at affordable prices and it reloads nicely too. My old Contender loves this stuff. Rated 4 out of 5 by Grey Dog from Great Value PPU offers great ammo at a great price. Rated 5 out of 5 by gravy from Oustanding Here is a hard to find cartridge. I use this when I want a wee bit more punch than can be delivered by a 22 magnum. They are well made and reasonably priced. Rated 5 out of 5 by workamper from Where else can you locate these for any price? Gfreat ammo -hard to find-at a fantastic price! Rated 5 out of 5 by Hijack from Shoots very accurate in my rifle. Was looking for the PPU brass and found this deal. Tried it , reloaded it, with cast bullets and tried it to complete satisfaction. Bought more.